Rose About Town: FREE-RANGE BABY LOSING FREEDOMS; BURP!! 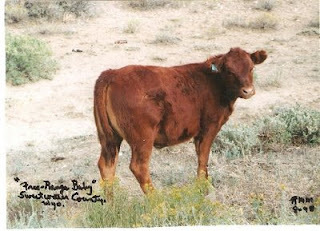 Years ago in Sweetwater County, Wyoming, I met this free-range calf and fell in love with him. I loved the fact that he wasn't fenced in; he was free to roam and graze as he pleased. To be sure, he was not a welfare animal waiting to be fed; he was a future full-grown steer filling his tummy at his own volition, and in the process ridding the prairie of a lot of flammable excess of vegetation. I've heard some free-range areas now require fencing; that doesn't surprise me, I guess. But now I read that farmers are being urged to find ways to feed their cattle with materials that won't cause them to burp and thus contribute to "global warming"... now that's a good example of mule-headed foolishness. As I have aged, I find I sometimes burp as well. Gotta watch that.